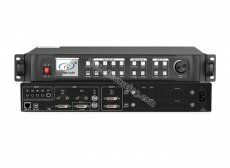 Kystar KS880 and KS890 LED audio and video splicing processors feature the following. The two output ports of the KS880/KS890 respectively output different parts of a picture to form a complete picture, which can be seamlessly spliced on the LED large screen. The KS880 can support up to 2560×1536 pixel spliced display. The KS890 can support up to 3840×1200 pixel mosaic display. The two outputs of the KS880/KS890 output a consistent picture, which is easy to drive two identical screens; it is also easier to connect to the control card when driving a single screen. And 2.6 million custom resolutions are supported in copy mode. The two output ports of the KS880/KS890 maintain the same signal output. The main channel acts as a programming output, driving the LED large screen, and the other channel maintains the original image, driving the local monitor without displaying black bars. The KS880/KS890 supports the ability to retrieve usage records and easily understand machine usage anytime, anywhere. The KS880/KS890 can set the working time. After the appointment time is reached, you need to enter the unlock password to use. If the device is not unlocked in time, the device will be locked and no other operations can be performed except for entering the unlock password. The device has no output during the lock process. KS880/KS890 comes standard with 6 channels of video input: HDMI × 1, DVI × 1, VGA × 2, CVBS × 2; all the way DVI loop ring out. In addition, the KS880/KS890 is equipped with 4 stereo inputs and 1 channel of audio, which can be used to specify the video signal for synchronous switching. The KS880/KS890 supports dual screens for picture-in-picture and off-picture display. It can also be used to control two screens of different sizes. All input signals of KS880/KS890 support fade-in and fade-out effects when switching, achieving the seamless switching effect and highlighting high-end quality. The KS880/KS890 supports Super Resolution scaling technology, which scales images to any size while enhancing the detail of the image. In addition, its LED smart equalization technology can bring better color performance to LED display systems.